Get creative and make each amenity look its best, even when small. Balconies. A 3’ balcony is comfortable for walking, but it should be 4’ wide to furnish, says designer Ruben Gutierrez, partner at Errez Design. Select a few tall plants such as tropical palms, hydrangeas and viburnum shrubs for privacy and to screen unattractive views. Porches. If you start from scratch or remodel, build your porch at least 8’ wide and 10’ long to arrange furnishings, so you can pull back chairs comfortably and circulate freely. Rooftop gardens. 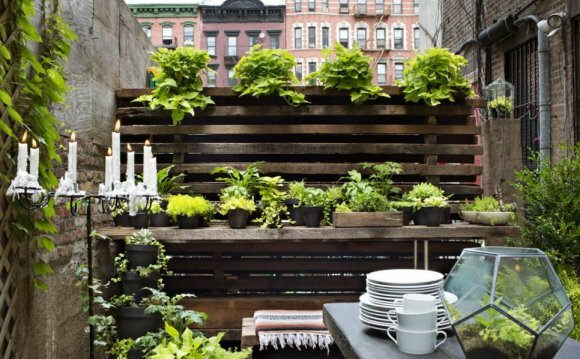 Research how much weight a roof deck can support before you purchase furnishings, plants, soil and pots. Lightweight choices are easier to transport up an elevator or with a crane. Weigh everything down in case of wind gusts; have sufficient water and electrical outlets for irrigation, lighting and outdoor cooking; and plan for drainage. Outdoor kitchens. Go with appliances you'll use most rather than duplicate your indoor kitchen when space is tight, such as a gas or charcoal grill or newer hybrid model; granite or poured concrete counter that does well in inclement weather; a side burner; and lots of storage. If you want a sink, check with your local ordinance permits, since you must tie hot water into your sewer line. Fireplaces and fire pits. There are many ways to include favorite options, even with less space. A fire pit can provide the same warmth and glow as a larger, more expensive fireplace, suggests landscape architect Stephen H. Wlodarczyk with Botanical Decorators. A fireplace will be more of an architectural focal point, but demands more space and typically costs $15, 000 to $20, 000. A fire pit or fire bowl can be portable, connected to a natural gas line or burn wood logs, and cost as little as $200. Water features. Even small yards can include moving water and trickling sounds. Consider a large urn, pondless waterfall or spa. Recycle water to conserve it. Add fish and colorful LED lights for a resort effect.